Ari's In Wonderland: Review: BYS Matte Lipstick in "Celebrity Status"
Review: BYS Matte Lipstick in "Celebrity Status"
When it comes to what finish I love most in a lipstick, it's matte. When it comes to what shades I love, it's definitely pinks and reds. Dark, almost vampy, reds are my ultimate favorite, and yes, I'll even wear them during the day! So you can imagine how happy I was when I found this particular lipstick from BYS that seemed to perfectly combine both my preferred finish and shade. BYS, which is an acronym for 'Be Yourself', is an Australian cosmetics brand that arrived in the Philippines earlier this year and so far they've been a big hit. I've seen bloggers raving about a variety of their products since then, especially their lipsticks which come in a wide range of types from lipstick-lipgloss duos to even color change ones! 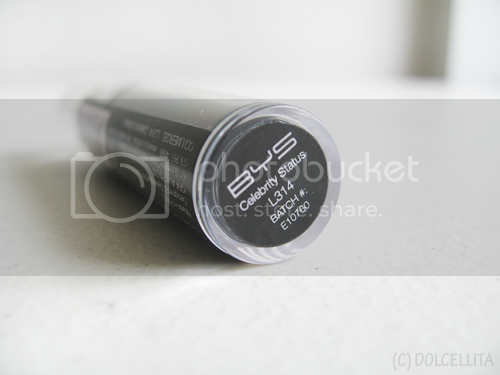 But BYS' Matte Lipstick and Longwear Lipstick lines are without a doubt two of the most popular. The one I chose, from their Matte Lipstick line, comes in a sleek, black tube with a semi-matte finish. The cap is clear, allowing you to see just how much product you still have left every time. However, the lipstick doesn't disappear into the tube completely (until it's nearly used up) so you have to be extra careful whenever you replace the cap! I asked the SA for their darkest red shade amongst the matte lipsticks and she recommended "Celebrity Status" to me. The product ingredients and other info are printed on an attached sticker which keeps the tube sealed. I recommend not removing the sticker entirely because it's a nightmare trying to remove the sticky residue after! Cutting a slit through the sticker just below the cap to allow it to be removed and replaced freely is best. The one thing I've noticed with BYS' lipsticks, at least from their Longwear and Matte lines, is that they're not visually pristine in condition as you'd expect from a brand new product. 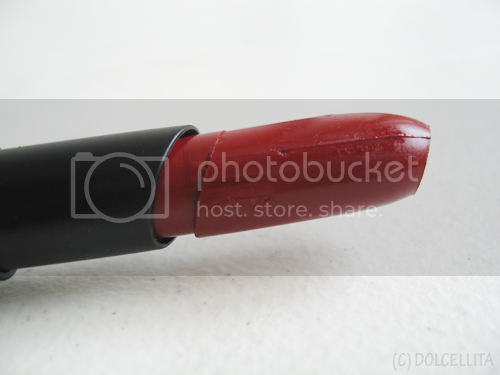 There are 'cuts', dents, and obvious lines from the mold that the lipstick was formed in. It doesn't affect the product's performance in the slightest, it's just something that surprises me as even much cheaper and local brands have lipsticks that actually look new. 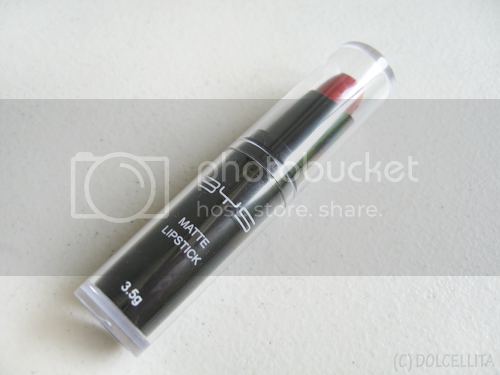 The formula surprised me as it's almost creamy and glides on smoothly like an ordinary lipstick and not a matte one. When newly applied, it has more of a satin finish. It becomes slightly more matte after a little while but not completely. As a result, unlike a typical matte lipstick, it also transfers easily. The color also isn't as dark as it appears on the lipstick itself, especially under bright, natural light like in the picture. It does appear more dark, vampy red indoors though. Forgive the slightly blurry picture, but this is what it looks like after five hours that included drinking and eating. It had started to fade, especially in the center, but the lipstick does leave a stain on the lips so that even so, it's not very obvious and you don't need to touch up right away. It also doesn't bleed or feather, so a lip liner isn't necessary, though it will of course help to make it last longer. My only disappointment with this lipstick is that it's supposed to have a matte finish, but...it doesn't. At least not completely. It does dry after a few minutes, becoming slightly more matte, and that's about it. It still transfers easily after hours of wear too unlike a lot of other matte lipsticks I've tried before. Don't get me wrong, I do love this lipstick as it's still a great red with good wear time. It just wasn't what I was expecting concerning a number of aspects, if you get what I mean. Highly pigmented. You only need 1-2 swipes on both your upper and bottom lip for full color. It stains the lips, making touch-ups both easier and less immediately necessary. Non-drying formula, but it may still cling to dry patches so a lip balm or lip scrub prior is still ideal. Wear time is very good. It's supposed to have a matte finish, but it comes out more satin instead. Not as dark in color as I was expecting. You have to be extra careful in removing and replacing the cap each time or risk damaging the lipstick itself. I love red lipstick! If I could only wear one kind of lipstick, it'd definitely be a nice, dark red. And I followed you back! Thank you, dear. It's a gorgeous shade of red, but I would be too chicken to wear something like this haha. I find it incredibly odd that a new product looked like it was used before, that's certainly not a plus point.. but I am glad to hear that the pigmentation of this product scores very high in your book. It's a shame that it doesn't entirely live up to your expectation, but you pull off the color very well though! Ooooooh thank you for the review! :D I've heard about this brand a few weeks ago and I've been curious how good BYS is. I'm currently in the US but I'll try to buy a lipstick myself from them. That shade looks good on ya! It's so vibrant, love it!! The color is super beautiful on you! The color looks great on you! I agree about it's finish, it looks way more satin than matte. Love that its vibrant!! I love dark reds too. I'm amazed at the staying power of this lipstick! Woww.. you're right! This color is highly pigmented. What beautiful color! Anyway, hope you can join / support my ongoing giveaway from a new sponsor. I like this finish! Its not glossy or completely matte. 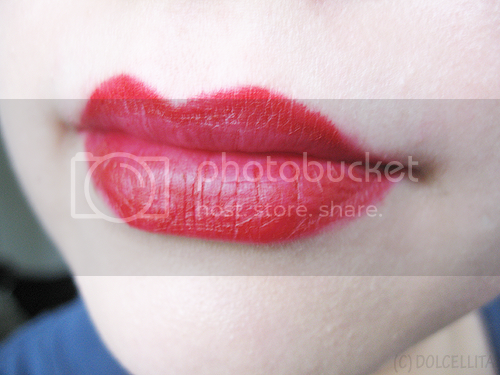 I like it when lip products stain the lips because it usually lasts much longer than regular lipstick. Love the color! Wow, that is such a vivid color! Gorgeous color! I've never tried this brand before. It's quite similar to this lipstick in shade, actually. But with the lipstick/lipgloss duos, I tend to wear them separately since I don't like how the gloss decreases the staying power of the lipstick! have never heard of that brand before! but it looks like a great product!! great color and long lasting!